How long have you had TMJ pain? I have had TMJ pain for the last five years or so and it progressed over time. I believe it started as a result of stress and I would clench my teeth at night, waking up with headaches, neck pain, and jaw pain. Can you describe how the TMJ pain effected your life and how it felt before you had neuromodulator treatment? I had several instances where I would experience severe headaches and pain stretching through my neck and I would have to leave work and go home to try to sleep. It impacted my overall health, ability to work, at times and my mood. I tried taking pain relievers, prescription muscle relaxers saw a chiropractor – you name it. These would help at times but were not long-term solutions and each also had other implications on my life. Was the treatment itself painful for you? Not at all. I didn’t know what to expect at first but it was a breeze. We have all had shots and blood drawn before and, in my opinion, I would take Botox injections any day over either of those. It’s just a slight pinch and is over with very quickly with no after pain. Can you describe how your TMJ pain has changed since your neuromodulator treatment? Do you experience any numbness or lack of sensation? 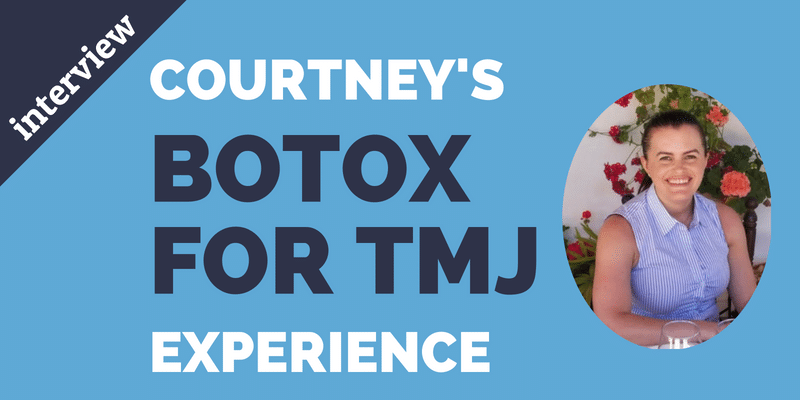 After starting Botox as a treatment for my TMJ I feel 100% better. It can take a few days to two weeks to fully kick in but it’s noticeable when it does. I no longer have jaw pain or any head/neck pain/stiffness as a result of the clenching. I find that I am sleeping better as well. One additional side effect that I do enjoy is my face is slimmer. When you have TMJ and the muscle is very tense, it’s bulky and can cause your jaw to look larger as a result – sometimes asymmetrical. With the Botox treatment, that muscle is relaxed and thus slims out my face where before I had some asymmetry because I clenched harder on one side than the other. Were you nervous to start Botox treatments? I was a bit nervous but I had done a fair bit of due diligence and seen the benefits. I didn’t know anyone else who had done botox for medical purposes so I was the first one. Since I started treatment, I’ve recommended it to everyone. It’s absolutely worth it. Why is Botox a better option for you than a night guard? A nightguard protects the teeth from grinding or clenching but doesn’t do anything to resolve the problem. I had tried various nightguards in the past but still woke up in pain or would spit them out during the night. That’s when I decided to research treatments on my own and came across Botox. It’s a fairly new treatment approach and not all dentists perform it or are aware of its benefits. I am originally from Boston and had a dentist there who knew nothing about it so I sought treatment elsewhere. I moved to NYC nearly two years ago and did my research and found CPW and that they offered it as a service and was delighted. Do you have any words of encouragement for people that may be on the fence? Botox is temporary so if you try it and its not for you, that’s ok, but its worth a try. If you are in pain, it’s better to look at the root of the problem, which Botox treats. If you’re interested in learning more about neuromodulator treatment for TMJ pain, you can read Dr. Kim’s Q&A here or reach out to us to find out if you might benefit.